Last Friday afternoon in New York City, something terrifying happened. I was walking through Central Park on a Friday afternoon when I became so blinded I couldn’t see my own hands in front of my face. I tried uncovering my face from my hands, but still, I couldn’t see . . . In pitch darkness with my arms stretched out like Frankenstein, I fumbled my way through a swarm of people. For nearly an hour, I groped everything in my path, including a newspaper stand, a mailbox, and a hot dog vendor (at least I think he was selling hot dogs). Forced to rely on my other senses to compensate for my lack of vision, I became increasingly attuned to the scents, sounds, textures and temperatures around me. I knew instantly, for example, when my path underfoot changed from cobblestone to gravel, to someone else’s foot . . . I attempted to make out the sounds: the trickling of a waterfall, the whoosh of a city bus, and the helpless screams of a tourist getting mugged . . . The experiential exhibit allowed my family and about a half dozen others on the 4:00 pm tour to temporarily experience what it’s like to be visually impaired. Our vision would be fully restored as soon as the lights were turned on. We relied on our partially blind guide, Ken, to lead us through the exhibit that takes visitors through a variety of simulated city environments, including the Bethesda Fountain in Central Park, in total darkness. Ken deftly took us through a series of New York City spaces and managed to calmly guide us nervous first-timers using only his voice. We were each provided with an authentic walking cane, which we swung like a pendulum across the ground. The canes helped us navigate when we weren’t tripping one another. “I found a carton of milk,” my son replied. “1% or 2%?” quipped Ken. “Anyone find the produce section yet?” Ken asked. Next we took a simulated subway, where just like on the real subway, I couldn’t find a seat. When we arrived at “Lexington Avenue,” Ken warned us of stairs ahead. “Stairs? You’ve got to be kidding me,” I mumbled. I suddenly understood why we were required to sign a waiver. Piercing by pineapple looked to be the least of my worries. A warm hand closed over mine and suddenly I felt safe. “Lisa, would you like me to help you find your husband?” Ken’s voice rang out next to me. I dropped his hand like a hot potato. I took a deep breath and inched my way down the steps slower than a pack mule descending the Grand Canyon. After we had all safely reached the bottom of the stairs and navigated our way down the hallway we entered a pleasantly scented room. “What do you smell?” asked Ken. “Coffee!” we answered in unison. “Starbucks!” my kids cried out, inhaling the aroma of fresh java artificially piped into the mock café. We fumbled our way into an actual booth and sat together, calm and relaxed for the first time in an hour. Ken answered our questions about what it’s like to be visually impaired. My daughter asked him how he matches his clothes, and he told us about a clothes-matching app for the visually impaired. The lights flickered on. I glanced at my son wearing a red plaid shirt and green-checkered shorts. I made a mental note to buy him the app. I left the exhibit with a renewed respect for the visually impaired. I vowed I would never take my sight for granted, whether I was picking out pineapples, matching my clothing, negotiating stairs . . . or, holding hands with a stranger. Looking for things to do with kids in New York City? Check out Dialog in the Dark and its neighboring exhibit at South Street Seaport, the Bodies Exhibit showcasing preserved human bodies dissected to display bodily systems. ← Loyalty to Job or Loyalty to Family? Fascinating! I didn’t know about this exhibit, but it sounds like an amazing experience. It’s dificult enough to navigate the crowded streets of Manhattan and its assorted puddles of unidentified liquids when sighted. I can’t imagine how challenging it must be to do it with a visual impairment. Thanks for sharing your experience. No doubt, it was a lesson in empathy. 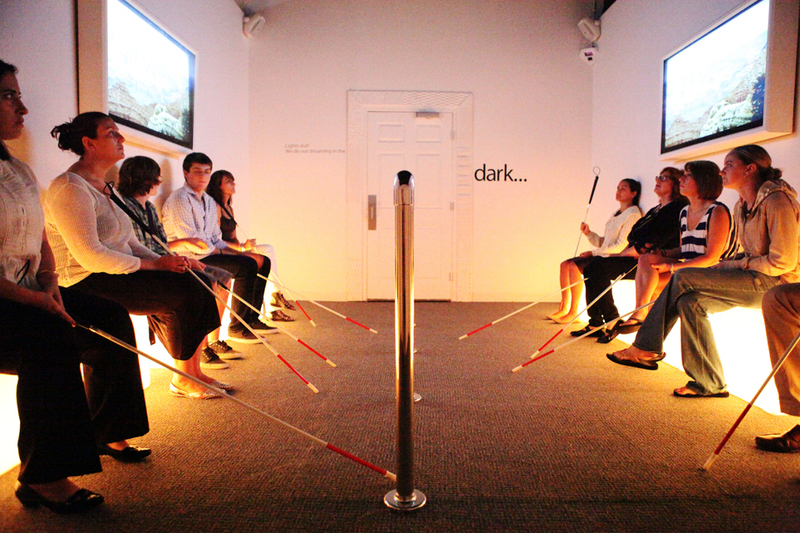 That’s a great idea for an exhibit and creating a greater understanding of the blind. I lived by the school for the blind in NYC and I was always fascinated at how the seeing-impaired made their way through such a huge city. It’s really amazing. That must have been an interesting place to live. I live near a seeing eye dog facility, and it’s always heartwarming to see people who are dedicated to helping train service dogs. My pleasure, and thanks for sharing the interesting link. My daughter studied in Israel last year and attended Dialog in the Dark in Tel Aviv. All of the students thought it was a fantastic experience. Thank you for this! What a great idea. It changes “I can’t imagine…” to an actual experience. Were the children quicker to adapt/less afraid? A very thought provoking post. Thanks! My pleasure, Cindy. I think I was more frightened than my kids! One couple brought a six year old who I thought handled it remarkably well. It’s a great experience for all ages. I was really scared for you as you began to describe your experience. I was relieved to find out it was only temporary and not real. This certainly would give people a feel for what it is like to lose a very important sense. Lisa, your descriptive writing really helped me “see” what you were going thru. Thanks for your concern, Judy. Fortunately it was only an exercise. And it truly did make me appreciate all of my senses. Glad the piece helped you experience it vicariously. More people should have an experience like this or similar like spending a week in a wheel chair. Makes you appreciative of your own well being and sensitive of the plight of others. Also makes you kick yourself when you have the” poor me’s” . So true, Carl. It’s always eye opening to walk a mile in someone else’s shoes. Sometimes I go through the day feeling so grateful for being alive and being healthy, with my senses in tact. What an interesting experiment you had. To respond to Ken’s question, “how DO you tell 1% from 2% milk?” Is there an app for that, to? I think it’s wonderful that you feel gratitude and don’t take your health for granted. Experiences like the one I had may be contrived but they can be a good wake up call. To answer your question, I don’t know. But there is some amazingly progressive technology out there now that helps the blind in many ways. What a great exhibit and experience! Sight is one sense I’d hate to lose. I’d rather spend the rest of my life not being able to hear or talk than not to see and observe nature’s beauty. Do you know if this is a traveling exhibit or is it will stay in NYC only? Yes, I “hear” you! To answer your question, the venues are worldwide, but I don’t know how long it will remain in NYC. I was not aware such an exhibit was in existence. The things we take for granted. Thanks for this reminder/wake-up call. You often see things in a different way after reading about insightful experiences like this. I’m a big believer in experiential learning. I wish there were more exhibits like this one. As frightening as it was, it was truly eye opening. (No pun intended). Thanks for stopping by and liking my post! I’m looking forward to reading yours and I loved your about me page! You did a great job in the dark, Lisa. Some years back I began to lose my sight and had to have lens implants; each day brings gratitude for all I can do. Thanks for your comment and for sharing your experience–the miracles of modern science! What a blessing. You’ve been nominated for the Illuminating Blogger Award! Sylver, thank you so much for nominating me! You are connected to such an interesting group of bloggers and I am honored to be a part of your world! Amazing – no end of fascinating experiences to learn about in New York (and I live in the suburbs.) thank you for writing about it. Absolutely–such a great cultural metropolis! Sounds like an amazing adventure! I can imagine really appreciating your sight after this experience. I know just reading this post about your experince gives me pause and a sense of gratitude. Thank you for your comment. I found the exhibit to be a profoundly moving experience and I hope that it helps people appreciate the challenges that your child and other visually impaired people face on a daily basis. What a cool concept! If I had used this method for all of my dates, I would have gotten more callbacks. Sounds like a terrifying experience, especially when you realize that blind folks are forced to go through this terror every day. It made me appreciate my sight and blessings, just reading your experience. It was a powerful experience that I was eager to share with readers. Thanks for commenting! What an interesting post. New York City has so much to offer. Yes, I’ll second all these comments – I think my greatest fear is blindness. Not to see this world? Inconceivable! Thanks for your comment, Frederick. It’s a profound notion.